Createk Outdoor Playground Boulders bring all the excitement and natural beauty of climbing on real rock straight to a public playground or your home’s backyard. 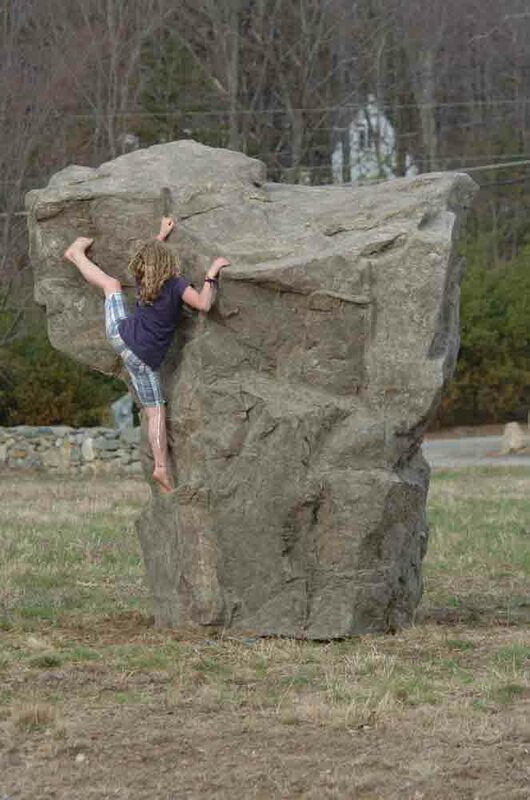 Many climbers out there have said that bouldering is climbing distilled to its purest form, and we see this everyday with kids who “boulder” up and around anything they can get their hands on. Open park spaces can be filled with these artistically sculpted formations to add variety and beauty to a green landscape, while also creating the opportunity for young people to learn balance and coordination. In large part because of its accessibility and social atmosphere, indoor bouldering has already swept the nation as an increasingly popular form of climbing for everyone, and our unique Playground Boulders are a brilliant way to combine the beauty and aesthetics of outdoor climbing and the simplicity and friendly texture, angles, and forms we find on indoor walls. Our Playground Boulders put traditional jungle gyms to shame! For public spaces, these boulders can provide a fun, challenging, and mentally stimulating activity for children while adding to the beauty of the natural environment. Whether incorporated into original landscape design for parks and recreation to maintain or enhance a beautiful landscape, or if added to an existing play area for parks or the home, the Playground Boulders can be a great natural and fun addition to your outdoor space. Our Playground Boulders are constructed of a unique combination of composite polymers to creat our Natural Rock system. Our design and construction crew uses this incredible product along with personal consultations and customized designs to construct an incredible work of art with each boulder. The result is an unbelievably lifelike and durable boulder, climbable from every angle at varying degrees of difficulty. Unlike other manufactures, we design all of our outdoor climbing walls to be completely scalable without bolt-on climbing holds but we also have the ability to add holds to provide additional climbing routes. Our boulders come complete with all of the cracks, bulges, crimps, and slopers of real rock. We will be surprised if you have seen a more natural looking product on the market, and priced so affordably. With four different sizes currently in production ranging from 3' to 8' in height, the range of options is excellent, whether for the toddler always eager to grab and pull, to older kids or adults who want the challenge of using climbing skills to get up and over and overhang to stand on top. Our Natural Rock Light is the most durable and realistic artificial surface in the industry. The surface is a composite polymer with fiberglass backing. Our rock surface is protected under US Patent. The patented process provides a UV stable surface that looks new long past the 5 year warranty. Our product is not affected by extreme climate change and will withstand freeze / thaw cycles unlike the way that the harder (brittle) concrete based GFRC product will. Chemicals and water minerals will not affect the surface or color of the rock. Unlike other products, our surface will not leach, lime or display calcium buildup. It is inert and will resist the buildup of algae and other organic growth. In fact you can power wash the wall up to 2500 psi. If for some reason a piece of wall chips it will look exactly the same because the color is infused throughout. Our rock surface is super lightweight which allows us to create super angles and features that could not be reproduced with heavier products. The rock surface has been wind rated up to 210 MPH and ASTM tested with a comprehensive strength of 17,000 psi. The XL Playground Boulder is built to offer the full range of the climbing experience. With a mushroom type shape, eight feet tall and twelve feet long, this wall will stand out as a bold feature of any outdoor landscape, and will also provide the most diversity in terms of climbing terrain. Designed to range in difficulty from one side to another, the climbing experience will vary depending on where you start on the boulder or what type of angle you want to climb. You can ascend the section of wall that leans in as a slab, or climb a more vertical section, an arête, pull a heel hook to top out on the overhang, or traverse the entire wall – all on the natural features. Because it also offers the greatest amount of climbing square footage, the XL Playground Boulder may be the best product to add the modular climbing hold option to, for more diversity in moveable holds and climbing options. With safety in mind, especially smooth curves and subtle changes in the rock angle are designed to minimize the chances of injury from a child from grabbing or hitting a sharp edge. Prices do not include Shipping & Packing. ShopTJB will get a current price quote from several LTL brokers to make sure you get the best price available for shipping to your location based upon the total amount of pieces ordered. We will contact you with the quotes for your approval before processing your payment for the boulders. Choose this option and we include a package of removable climbing holds with internal threading to connect the holds. Holds can be added and removed to provide for additional climbing routes. The holds are typically colored to match the tones of the rock surface but we can provide them in bright colors upon request. 1. Boulders must always be placed on level, stable, compacted and well drained ground. Concrete footings are optional but not required. structures are within the 8’ climbing safety zone. over it once the anchor is driven into the earth. installation. This provides flexibility if one location is not able to be utilized. b. The following is the minimum number of anchors needed per Boulder. 5. Follow instructions provided by the manufacturer ‘Manta Ray’ for driving the Earth Anchors into the ground. 6. Drive the Earth Anchors until about 2” of the threads are left exposed above the leg bracket. This will allow the leg bracket to be lifted and set over the anchor. Do Not set (pull up) the anchor until all of the anchors are driven into place and the leg brackets have been lifted over the threads. 7. Once all of the Earth Anchors have been driven into the ground, lift and place the leg brackets over the Earth Anchors. Place the large steel plate washers over each anchor and install the nut. 8. Tighten each nut as specified in ‘Manta Ray’ instructions. This process sets the anchor into place. 9. Cut off the excess threaded rod with a sawzall or reciprocating type saw. Grind off any sharp edges as necessary. 10. Cover the area with bark mulch or other landing surface as may be required by local codes and ASTM F-1292-04. Note: These fantastic rock creations are custom made to order and may take 14-21 business days to produce (a little longer during the busy periods). Each rock goes through 6 processes before it is shipped. First, we mix our patented compounds to your color choice and line the rock mold to the correct thickness forming your rock. Second, we allow the compound to cure & dry then we remove it from the mold. Third, on some rocks, we then spray a fiberglass reinforsement layer on to the inside of the rock. This then has to cure. Fourth, we trim off any excess compond and fiberglass so your rock will sit flat. Fifth, we apply a waterproffing sealer to the outside of the now cured rock compound so it will last for many, many years. Sixth & last step, we select the proper box and pack your order so it can be safely shipped to your location. Shipping costs include a pallet, labor and packing materials to protect your order, & LTL shipping to your location. If you want to save on shipping costs, you are welcome to do a factory pick-up. We are located in Southbridge, MA 01550. If you want to do a factory pick up for this order, please let us know in the comment section and we will manually remove the shipping costs from your order before we process your charge card. A new order confirmation will be sent to you.